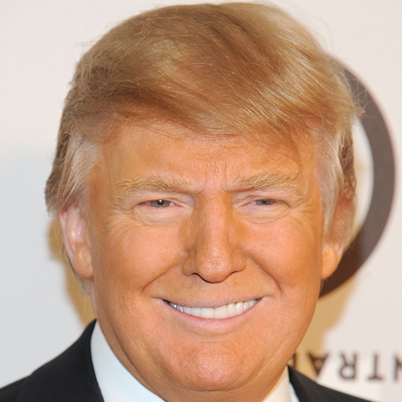 Our EXCLUSIVE investigation into the origins of Donald Trump's hair can now be revealed. While the untamed, flesh-ish colored fur-like thing resting atop Trump's head may look like his own hair, our investigators were shocked to discover its true origin: a genetically modified rodent. 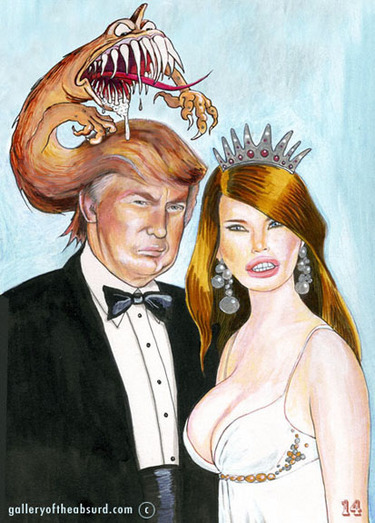 We learned that Trump employs a team of scientists consisting of biologists, geneticists and cryptozoologists who work full-time behind the ornate golden doors of a secret laboratory located inside Trump's gaudy lavish New York penthouse. Their job is to create and raise a large herd of furry, chimera-like rodents consisting of the spliced DNA of orangutans, rabid weasels, caterpillars and most troubling, a dead chupacabra found flattened on a remote road in East Texas. Trump barges into the laboratory every morning to mercilessly grab a woeful creature and slap it atop his head. 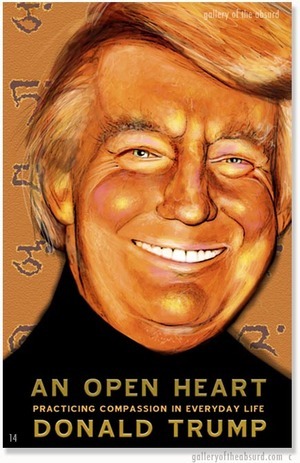 The younger, smaller creatures are used as Trump's eyebrows and if you look closely, you may observe them curled up and sleeping on the hot orange flesh above The Donald's angry eyes. Medium: graphite on paper, digital paint. Visit 14's Facebook page for more thrills and chills! 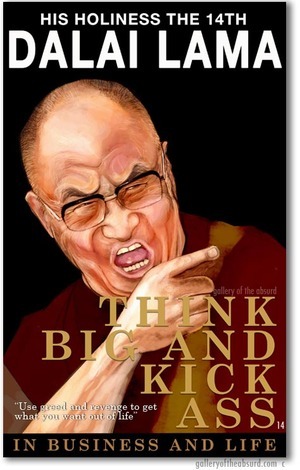 What If The Donald and The Dalai Lama Switched Books? How not to take crap from people. Fight back, be brutal and win! Why you can't be too greedy. Material possessions and the relentless acquisition of wealth is the only way to happiness. 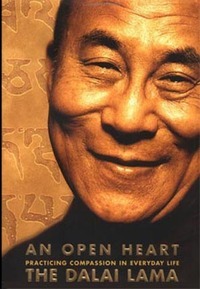 How compassion toward fellow humans will only get in the way of your success. Rosie O'Donnell is stupid and her book will never sell as many copies of mine. Why the prime purpose in life is to help others. How the roots of all goodness lie in the soil of appreciation. Why love and compassion are necessities, not luxuries. How materialism and consumerism lead to suffering. Rosie O'Donnell is a human being whom I love and respect. Medium: fake books are ink on paper with digital color, real books are images snagged off Amazon. A few weeks ago, I was blissfully walking down the street and thought I saw Donald Trump. It didn't really register and I walked a few more steps until I stopped in my tracks and decided to go back. Cautiously I approached The Sharper Image and peered in the window. It was true - I DID see Donald Trump! There was a large image of Trump in the front window and a video featuring him boasting about his "super premium Trump Steaks". Even though my eyes saw it, my mind couldn't get around what I was looking at. 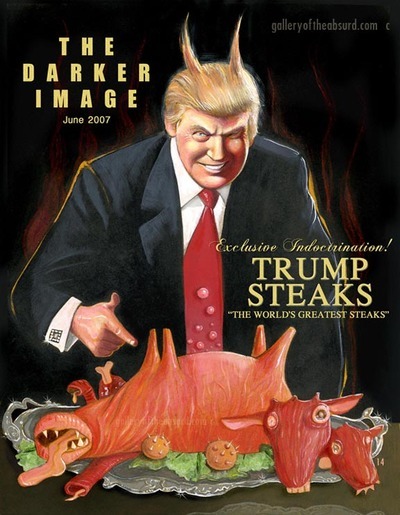 Trump is offering his steaks exclusively through The Sharper Image. A retailer better known for selling items such as turbo nose hair clippers, talking chimp heads, and remote control robotic sharks, they are now proudly offering mail-order Trump Steaks. How fitting, no? I had to pick up the brochure and highly suggest you do the same. 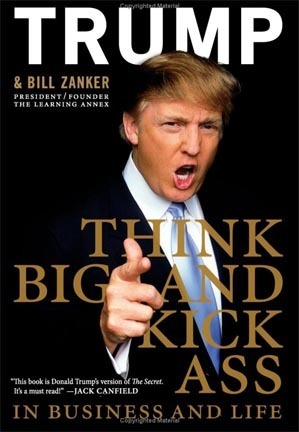 The cover features a heavily retouched image of Trump hunched over a big plate of meat. If you stare long enough, the Trump Steaks start to look like some sort of glistening beef creature. Trumps leers as he gesticulates his carefully rehearsed "you're fired" hand toward artfully arranged steaks on a silver platter. His stubby little hand is dwarfed by the enormous steaks and his cotton-candy hair is the same color as his skin. Overall, a chilling Dante-esque vision of Hell. Medium: acrylic, ink on board, digital text. If you can't get to a Sharper Image to pick up the Trump Steaks brochure, no worries. I've boiled it down and reinterpreted it here for you. Medium: digital paint and collage. "Trump super premium luxury Valentine candies are a big idea. 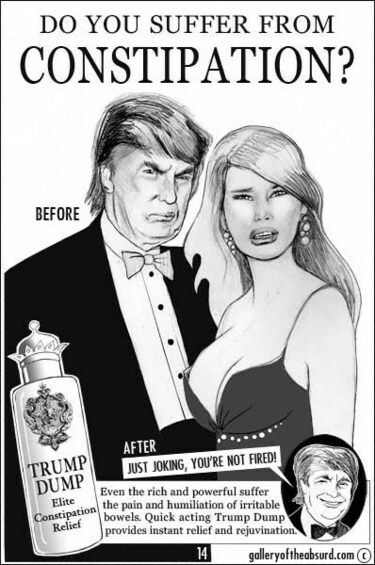 Everyone knows the Trump brand is the most recognizable and valued global trademark in existence today. When people see the Trump name, they know they're buying the unrivalled cache that only Trump can provide. These superior candies are crafted from the world's finest ingredients and will rapidly evolve into the unquestioned preference of uncompromising consumers. Trump Valentine Conversation Hearts will outsell all other candies in the Valentine consumables category and if you don't agree, you're a big fat ugly loser idiot with a fat disgusting head and I will take great pleasure in witnessing your public humiliation and failure." There are so many endless possibilites to lampoon Donald Trump's orange cotton candy hair, but I found it most fulfilling to imagine him getting attacked by it. Behold the Donald Trump Hair Beast! When he's not pouting or throwing temper tantrums, Donald Trump and his oddly beautiful alien-esque wife, Melania Knauss look as though they suffer from constipation. All that money, power, and opulence...and yet the two of them can barely muster a smile. In the spirit of The Apprentice, I created a Trump branded product that could revolutionize the pharmaceutical industry. Don, whatcha think? Am I hired?